I went to Stamford Connecticut to direct a bunch of episodes of ARE WE THERE YET? the TBS sitcom with Ice Cube, Terry Crews and Essence Atkins. I don’t normally direct multi-camera stuff, but I did this time for several reasons. One, I got a whole lotta “family” on that show. 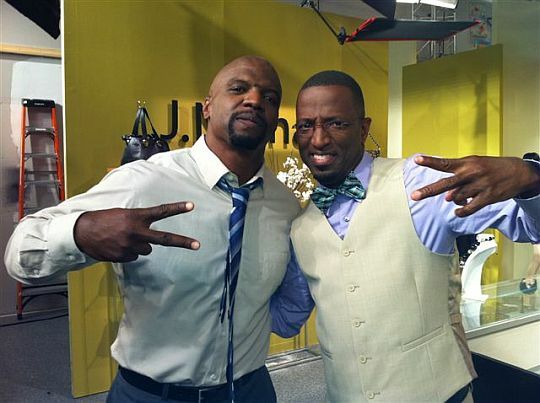 Terry Crews is one of the most admirable men I know. He played special teams in the NFL for seven years. He played internationally in leagues where if you get hurt there’s no health coverage, you’re just screwed. Then he made the successful transition to Hollywood, which very few professional athletes do. Terry’s the kind of actor who gets cast a lot because he makes everyone around him feel good. He’s a hard worker with a positive outlook on life. That’s why I suggested he play the dad when I directed the pilot of EVERYBODY HATES CHRIS and everyone agreed. He’s also a devoted family man who loves his wife and children…so much they made a reality show about it. Terry stays humble, and never stops working harder than anybody else. He’s a living inspiration. 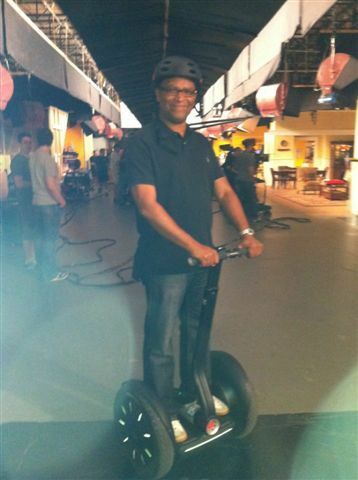 Somehow I didn’t get a picture of Ali LeRoi on set, which is a damn shame because he’s the executive producer of the show. I’ve known him since he was part of a pioneering black comedy troupe called Mary Wong, who worked very much in the spirit of Monty Python. Chris Rock hired them for his HBO series, and they also worked on his movies, like the subversive POOTY TANG. Ali then ran EVERYBODY HATES CHRIS, which gave him the experience to take on the challenge of producing a show where they produce three episodes a week. The good part of that is they will have 100 episodes in the can by the end of the year, setting them up for syndication riches…but man that’s an enormous amount of work. Fortunately Ali is not only very funny but very methodical and organized. He works hard, but he carries himself with a mellow even tone. Very impressive. I’ve known Ice Cube since the beginning of his movie career. Like Terry and Ali, he’s a very hard worker. We worked together on a film script, but he already had a novel and several other scripts under his belt by then. He was an unpretentious dude and a real family man. The movie never happened but I still treasure those days together that we worked on it. His producing partner, Matt Alvarez, also handles his and our kids are in the same class at school. So when they asked me come do the show, I had to get down. The rest of the cast is great too. Essence Atkins is low key but a very talent comedic actress. Keesha Sharp is beautiful and hilarious. Christian will forever be loved for his sketch on the Dave Chappelle Show, but he comes with it on every episode. And the kids in the cast are total pros with tons of talent. Add in a fantastic and charming crew, and what looks like an impossible work of week flies by.